How to Make Chai Tea From Scratch (In Bulk) - Oh, The Things We'll Make! Save yourself money while you avoid the artificial flavors in most store bought chai flavored teas by learning how to make chai tea from scratch in bulk. 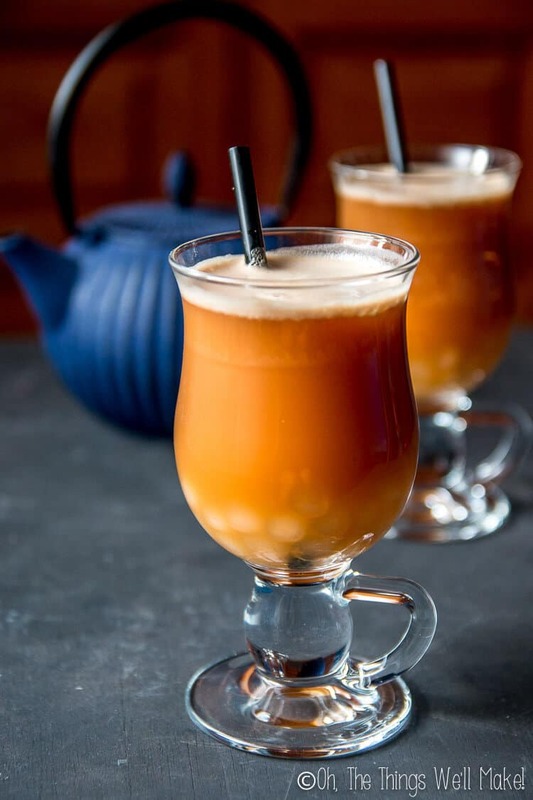 I know this isn't the first time that somebody has shared a chai tea recipe on the internet, but when doing a search, I couldn't find any recipes that shared how to mix up a big batch of loose chai tea. The recipes that I saw were all for making either one serving of chai tea with freshly sliced ginger, or for making a fresh chai tea concentrate that needed to be stored in the fridge and used up within a week. Don't get me wrong. Those are great recipes, and probably make a better, fresher tasting chai tea. But, let's be practical here. I wanted to mix up a big batch of mixed chai tea that I could either spoon into fillable teabags or use with a teapot with mesh strainer as needed. Let's face it, I make so many of the things that we use or eat that I don't want something that I'll have to make from scratch on a daily, or even weekly basis if I can avoid it. With as much as I love chai, I go through a lot of it, so I wanted to make chai tea in bulk! Despite being somebody who makes almost everything myself, I had conformed to buying boxes of chai tea from the store. To make matters worse, I didn't always buy organic chai tea. One day I stocked up on five boxes of an inexpensive Chai tea to just to fill up an Amazon Pantry box that I'd started when buying foods for my son's 7th birthday party. What? 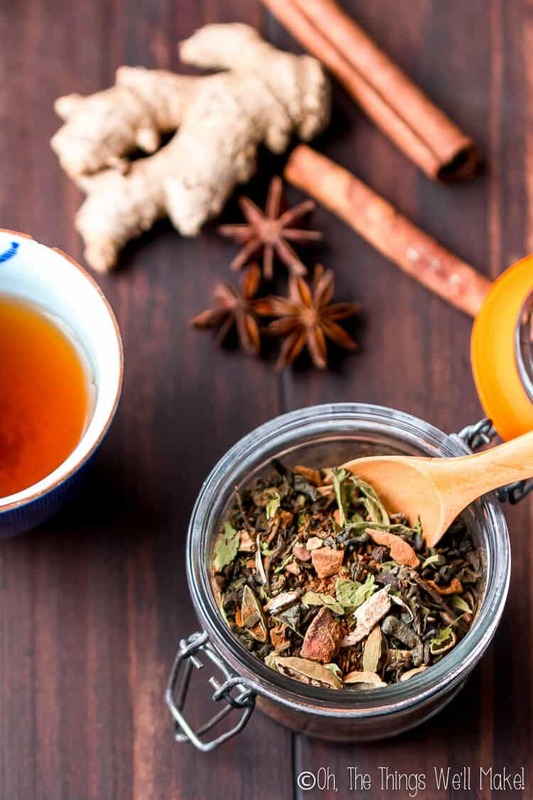 I had always assumed that all chai tea was just a mixture of tea and spices, and never even considered that I was ingesting the artificial flavors I'm always trying to avoid! It turns out that while the tea included “black tea” and cardamon and cloves in it, it also included “natural flavorings,” whatever those may be. You may be thinking that, well, at least they're “natural flavorings” and not “artificial ones,” but you'll probably not be surprised to find that there isn't really a huge difference between artificial and natural flavorings. In any case, what bothers me most is that something has an “ingredient,” or a mixture of many ingredients in it, called “flavoring” that allows the real ingredients to be hidden from me. I don't know what I'm ingesting, and I don't like that! Ignorance is bliss. I had been happily sipping on my store bought chai tea and hadn't even noticed how artificial it really did taste until it was pointed out to me! From that day forward, I started studying the different chai teas at the stores, and noticed that pretty much all of them have “tea” and various spices listed as ingredients, but are also “enhanced” with artificial or unknown “natural” flavors. The term “Chai tea” is a bit redundant as “chai” actually means “tea” in hindi. 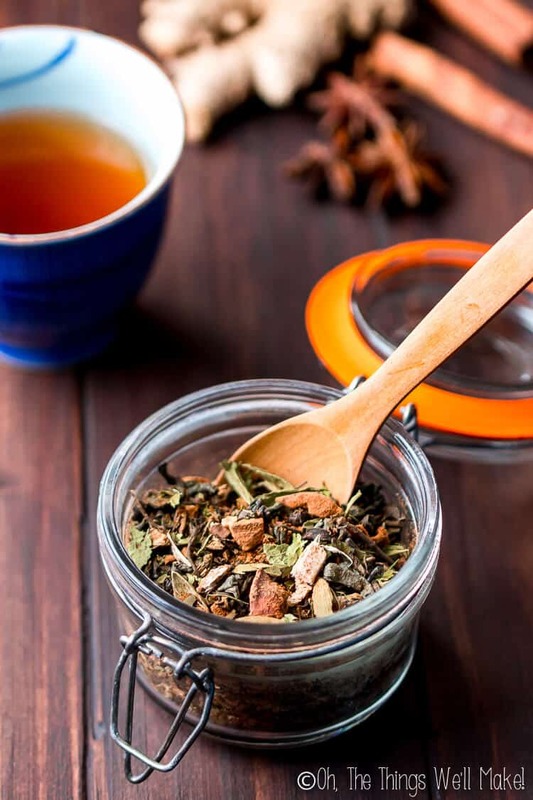 Chai tea probably has its origins in India, or at least it is mostly associated with that area of the world, and is a is a tea blend normally made with black tea leaves mixed with various spices. What spices are included in masala chai? 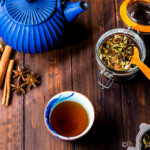 Chai tea has a very distinctive blend of strong flavors that people seem to either love or hate. At our house, I get to keep it all to myself as I happen to love it, while my husband even avoids the scent. 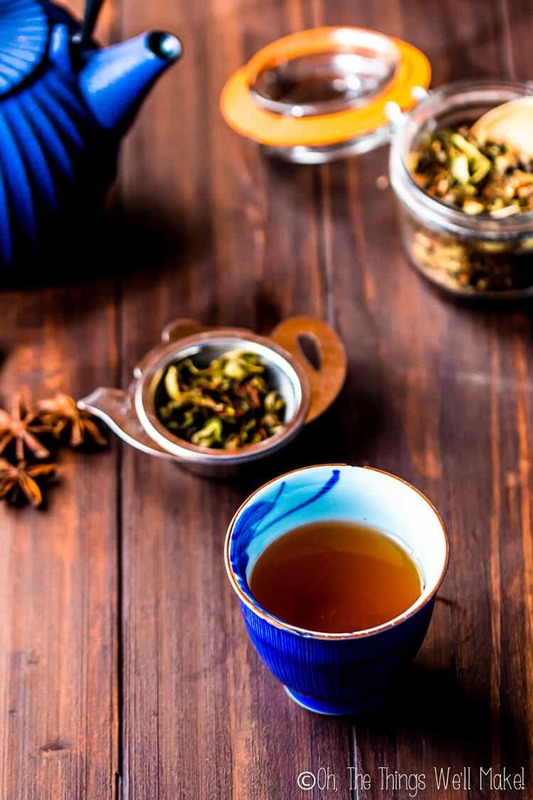 The strong flavors of masala chai are comprised of a variety of spices that can be customized to suit the tastes of the person making it, but some of the more commonly used spices include cinnamon, cardamon, and cloves. Ginger is also normally added, giving it an extra flavor kick. Those who prefer a spicier chai can add peppercorns. Other people love to add fennel, anise, and/or star anise, and I think those add a nice subtle sweetness and balance out the flavors. Why do I add Stevia? For several years now, I've been following a low sugar diet, and most of the time, I drink all of my teas unsweetened. Something about the spiciness of chai tea, though, is enhanced when you add a tiny bit of sweetness to it. Chai lattes are wonderfully complemented with honey, and if you want a sweeter chai latte, I'd still suggest adding a touch of honey or maple syrup. But what about those times that you just want a cup of tea and don't want to add sugar? That's how I normally drink my chai, so I decided to add some stevia leaves to my chai blend. It adds a tiny bit of natural sweetness without adding sugar or extra carbs. That means I can drink it even in my fasting hours when doing intermittent fasting. Please, as always, use the recipes as guidelines, and adjust them to suit your personal taste! I added a lot more spices to my chai tea recipe than the recipes I had tried online. Perhaps that's because I'm used to the strong flavors in the store bought chai teas that have been enhanced with artificial and “natural” flavorings. 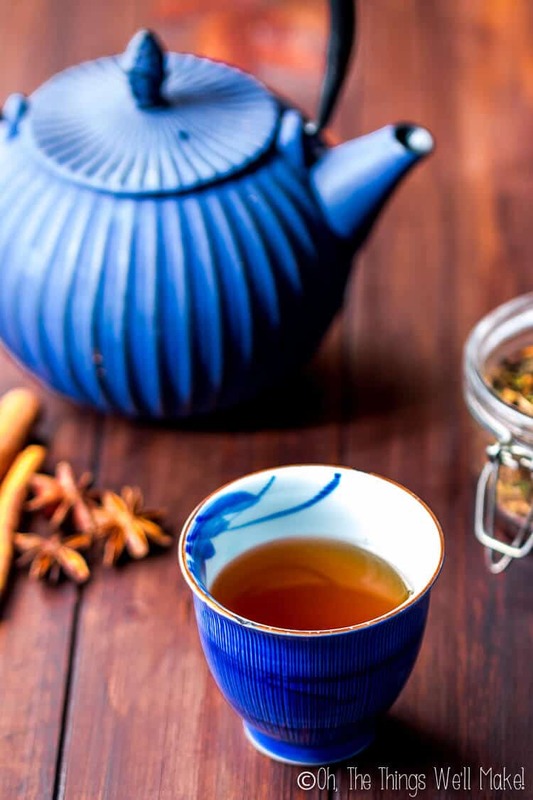 If you are making a big batch of chai tea concentrate, you are using fresh ginger or infusing the spices for long periods of time before adding in the black tea, so you can get away with using much smaller amounts of spices. If, on the other hand, you are like me and want to mix the tea with the spices to make pre-made teabags that can be brewed in a few minutes with no need to pre-brew the spices, you'll need to add a higher concentration of spices to your mixture. That's what I wanted, and that's why you'll find that my recipes uses a higher concentration of spices to tea than most. I want a strongly spiced tea that can be brewed in minutes. If you want your tea more or less spicy, adjust the tea to spice ratio accordingly. In the same way, you can adjust the amount of each individual spice used or leave out any spices that you don't like altogether. This spicy masala chai is the perfect comforting pick-me-up on those cold dreary winter days. Makes around 50 2-teaspoon sized servings which should make around 50 8-oz. cups of tea. Mix together all of the spices, coarsely grinding them in a blender or coffee grinder. You want to use smaller pieces of the spices to have them infuse properly, but at the same time, don't want to end up with a fine powder. Mix together the coarsely ground spices with your tea of choice and add in crushed up stevia leaves if desired. Your chai tea is now ready for using. You can either spoon in around a tsp. of the mixture into teabags to have ready to use chai teabags for individual servings, or add the desired amount to a teapot. Recipe nutritional information is calculated based on full amounts all of the leaves and spices. 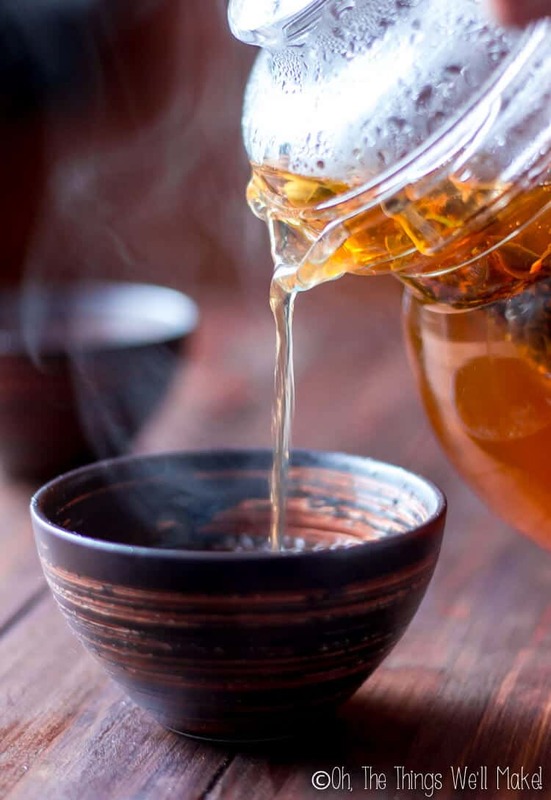 Because you will be drinking an infusion of the tea and spices rather than ingesting them all, actual nutritional information amounts for brewed tea will be lower. This homemade chai blend can be used in tea filter bags that can be bought empty and filled with the tea of your choice. I prefer using unbleached filter bags when using these sorts of paper filters. This is probably the most convenient way of making your chai tea when on the go. If you're looking for a more environmentally friendly filter idea, though, you can try making your own reusable cloth teabags out of old clothes. I upcycled my son's old organic cotton onesies' sleeves into homemade reusable teabags. With as practical and frugal as those teabags are, I have to admit that I spent way too much time checking out the super cute tea infusers that I found online. I feel in love with a cute silicon hedgehog that hangs on the edge of your cup, but I'm sure my mom would prefer the cute little pug infuser instead. If you're looking to make more than a cup at a time, though, I'd suggest using a teapot with a filter or a french press. Nowadays, that's what I use most. One of my favorite ways to serve chai tea is to make a chai latte. If you want to make things even more fun, try adding some boba to your chai latte. I show you how easy it is to make homemade boba from scratch using tapioca starch in a matter of minutes. I actually find it easier to make them myself as I haven't found a good brand of pre-made tapioca pearls that cooks easily and quickly. I love ginger chai tea and look forward to trying your recipe. I also love the blue cast iron teapot and cup featured in your Vega ginger chai tea post. It looks Japanese. Can you perhaps advise where I can buy these from? I actually bought that teapot several years ago at a local Asian store. It’s a cast iron teapot, so if you search online with those keywords, you should be able to find a nice variety of them. Came across your page today while I was looking for information on preservatives. I am from India and chai is the first thing to go for in the morning and in the evening. Every guest is offered a cup of chai. Wanted to share variation. We take water and keep it for boiling. In this you can add fresh lemon grass ( boosts immunity) esp in winters, or few green cardamom crushed, or fresh ginger crushed (all this in pestle and mortar). Then we add tea leaves as per taste. Sweetness line sugar or jaggery is added. We prefer milk on our tea so we add milk bring it to a boil. We use a sieve before pouring it in cup. If you want I can share the traditional masala recipie. I’m sorry I missed your comment when you first left it! I usually use an organic black tea (something like this one), but I’ve also tried making a green chai too and I also like it. If you are looking for something with less caffeine, you can use kukicha tea. If you want something without caffeine, even something like chickory can work well. As you can probably tell, it’s very customizable. The other ingredients add a lot of flavor and can really transform whatever base tea you decide to use. We call it Christmas in a cup! I absolutely love this recipe!! I tried a Pinterest recipe earlier and was not impressed. I finally got around to it this past weekend and can’t get over it!!! Thank you for doing this and staring the rest of us all the work! I’m so happy you liked it as much as I do. These messages are what makes it worthwhile, so thank you! This will be my ‘go to’ recipe from now on. Thanks for a great bulk chai recipe! I’m not sure. It depends on the types of teas you are wanting to sell. I love teas that have other herbs and spices in them. This chai tea is one example. Cinnamon is a great addition to teas as it adds a lot of flavor and a bit of sweetness. I also love teas with vanilla, licorice, etc. Thank you for this post I can’t wait to make it! Im wondering toasting /warming up some of the spices in a dry frying pan to release the aroma would enhance or take away from the flavour? That’s an interesting question that I hadn’t even considered! Too bad I actually just made a large batch again yesterday after mostly finishing up my last batch, so it may be awhile before I can give it a try. I just did a bit of research and some places do say to toast the spices to enhance their flavor, but you have to be VERY careful as they burn easily. If you do give it a try, I’d love to hear how you like it. I’ve done this and definitely enhances the flavours, particularly with the cloves and peppercorns. Yay! I’m so happy to help.